Plenty of directors have constructed comedies of manners by sitting people of disparate social classes together at the dinner table. Though there can be simultaneous elements of envy and wish fulfillment to it (“Look at that fancy food! Imagine getting to eat like this!”), pairing of slobs and snobs mainly allows both groups learn from one another. 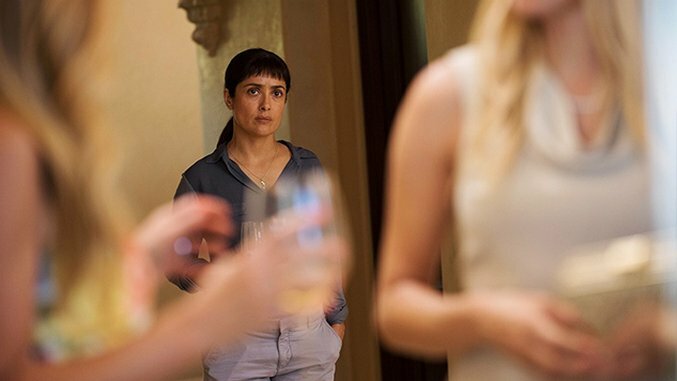 Beatriz at Dinner takes this setup in a quite dark direction, starting with the premise that getting into such a dinner will bring you face-to-face with the kind of person you hate most in the world. Beatriz (Selma Hayek) is an alternative medicine healer and masseuse whose car breaks down after she services wealthy client Cathy (Connie Britton) in her stately SoCal seaside gated community mansion. Faced with a frighteningly long trip back to Altadena, Beatriz is instead invited to stay for dinner by Cathy, who fancies her part of the family, since Beatriz helped Cathy’s daughter recover after chemotherapy. As guests arrive, Beatriz at first experiences simple fish-out-of-water discomfort, but her uneasiness turns to dread when she learns that Cathy’s husband’s business partner, Doug Strutt (John Lithgow), is a powerful property magnate whose projects have ruined ecosystems and displaced people from their homes all over the world. Confrontations ensue, dinner growing increasingly tense. Beatriz at Dinner is the third collaboration between director Miguel Arteta and writer Mike White, after 2000’s Chuck & Buck and 2002’s The Good Girl. Where those films were character-driven dramedies, this one leans more into the political direction White’s other projects have taken, such as Year of the Dog or his criminally underrated TV show Enlightened. Like in those stories, this film focuses on the specific sense of helplessness felt by people who care deeply about certain social issues who find themselves up against the seeming intractability of such problems. An immigrant, an activist, an environmentalist, a vegetarian, Beatriz sees in Doug a nemesis, even half-jokingly calling him such at one point. He gushes about the thrill of big game hunting, brags about avoiding legal penalties for his shady business dealings and crudely questions Beatriz’s legal status. He refuses to see the error of his ways, no matter how passionately Beatriz argues against him. Early scenes in the film demonstrate White and Arteta’s harrowing satirical sense, with Cathy’s friends reacting to Beatriz’s presence in painfully awkward but believable ways. White’s script and Arteta’s direction are in perfect sync: Every well-meaning verbal faux pas is beautifully cringe-inducing, while the visuals emphasize the social gap even in ways as simple as how Beatriz’s sneakers make her seem a head shorter than the high-heel-wearing high-society women. But that lighthearted edge sharpens as the film goes on and Beatriz gets more frustrated by having to spend time in close proximity to Doug, who reveals no redeeming features, even as he protests that he’s quite philanthropic, actually. Sadly, this transition also causes the movie to gradually lose its coherence. White and Arteta have a solid foundation but seemingly no idea of where it could go. Indeed, given the subject matter, there may be no realistically satisfying conclusion possible. What can you say or do to the sort of person who’s making the world a worse place that could grant you some emotional closure? The film fails this challenging thought experiment, eventually finding nowhere new to go before wrapping up in a way that doesn’t feel earned or make sense at all. Still, Hayek maintains a strong performance throughout, doing a magnificent job of conveying the myriad emotions Beatriz must tamp down. It’s always a treat to see her handle more dramatic work, and this is a solid showcase.